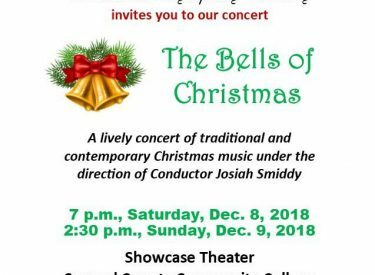 The public will have two opportunities to enjoy the Southwest Symphony Society’s concert, “The Bells of Christmas,” at 7 p.m. Saturday, Dec. 8 and 2:30 p.m. Sunday, Dec. 9. Both concerts will be at the Showcase Theater on the Seward County Community College’s campus. Admission is a free-will donation at the door and refreshments will be served. Orchestra performers will include: First Violins – Bethany Adams, Blinda Massa, Rebekah Strand; Violas – Nancy Allen, Alison Rice; Cello – Troy Skinner*; Oboe – Alisa Henderson; Flute/Piccolo – Claire Thompson, Jerilee Rediger, Marieka Ford; Clarinet – Shelly Rowson*, LaRie Hillman; Trumpet – Chris Ford; French Horn – Amy Whitaker, Sherry Moentmann; Tombone – Caleb Linkhous, Natasha Hallam; Euphonium – Jacie Butler; Tuba – Noel Delgado; Percussion – Melanie King, and Christina Abel. Vocalists will include Angela Smiddy and Steve Leete. The Southwest Symphony Society is a Liberal non-profit organization dedicated to promoting classical and contemporary music in the community utilizing the talents of local and professional musicians. For more information, contact Burtzloff at 629-0203 or visit the Symphony’s Facebook page.